^ a b c d e f g h 植村 pp. 21-24. ^ Meri, Veijo: "Suomen marsalkka C. G. Mannerheim" (1990) pp. 107–108. ^ Meri, Veijo: "Suomen marsalkka C. G. Mannerheim" (1990) p. 108. ^ a b Mannerheim - Marshal of Finland, TV8, 2006. ^ Jägerskiöld, Stig: "Nuori Mannerheim" (1965) pp. 68-70. ^ Visuotinė lietuvių enciklopedija, V t. Vilnius: Mokslo ir enciklopedijų leidybos institutas, 2004. T.V: Dis-Fatva., 163 psl. ^ a b Jägerskiöld, Stig: "Nuori Mannerheim" (1965) pp. 93-94. ^ a b 植村 pp. 28-30. ^ Jägerskiöld, Stig: "Nuori Mannerheim" (1965) p. 92. ^ Meri, Veijo: "Suomen marsalkka C. G. Mannerheim" (1990) p. 121. ^ a b Meri, Veijo: "Suomen marsalkka C. G. Mannerheim" (1990) p. 123. ^ a b c d e f g h 植村 pp. 31-36. ^ Meri, Veijo: "Suomen marsalkka C. G. Mannerheim" (1990) p. 129. ^ Meri, Veijo: "Suomen marsalkka C. G. Mannerheim" (1990) pp. 145-147. ^ Meri, Veijo: "Suomen marsalkka C. G. Mannerheim" (1990) pp. 148-149. ^ a b c d 植村 pp. 42-51. ^ a b 植村 pp. 51-54. ^ Tamm, Eric Enno. The Horse That Leaps Through Clouds: A Tale of Espionage, the Silk Road and the Rise of Modern China. Vancouver: Douglas & McIntyre, 2010. ^ a b c d 植村 pp. 55-60. ^ a b c d e f 植村 pp. 60-64. ^ a b 百瀬・石野 pp. 344-347. ^ a b c d 植村 pp. 65-69. ^ a b c 植村 pp. 72-76. ^ a b c d e f 植村 pp. 76-81. ^ a b c d e f g h 植村 pp. 81-91. ^ a b c d e f 植村 pp. 92-97. ^ a b c d 百瀬・石野 pp. 162-165. ^ a b c 植村 pp. 99-102. ^ a b c d e f g 植村 pp. 103-107. ^ a b 植村 pp. 108-113. ^ a b c d e f g h i j 植村 pp. 110-118. ^ a b c d e f 植村 pp. 119-121. 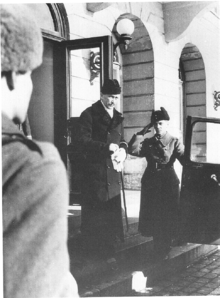 ^ See, for example, Kallio - Ryti - Mannerheim" / Suomen presidentit II: Kallio - Ryti - Mannerheim, Helsinki: Otava Publications Ltd., 1994; Stig Jägerskiöld, Mannerheim 1867–1951, Helsinki: Otava Publications Ltd., 1983. ^ a b c 植村 pp. 123-126. ^ a b 百瀬・石野 pp. 69-70. ^ a b c 植村 pp. 129-130. ^ a b 植村 pp. 130-134. ^ a b c 百瀬・石野 pp. 72-75. ^ Martti Turtola, "Risto Ryti: A Life for the Fatherland"
^ a b c 植村 pp. 173-179. ^ a b 植村 pp. 180-183. ^ a b c d 植村 pp. 191-195. ^ Helsingin Sanomat International Web-Edition - "Conversation secretly recorded in Finland helped a German actor prepare for Hitler role" Helsingin Sanomat / First published in print 15.9.2004 in Finnish. ^ See, for example, Martti Turtola, "Risto Ryti: A Life for the Fatherland" / Risto Ryti: Elämä isänmaan puolesta, Helsinki: Otava Publications Ltd., 1994; Edwin Linkomies, "A Difficult Time" / Vaikea aika, published in Finland in 1970. ^ a b 植村 pp. 242-244. ^ a b c d e f g h i 植村 pp. 202-206. ^ a b 植村 pp. 206-208. ^ Meri, Veijo: "Suomen marsalka C. G. Mannerheim" (1990) p. 397. ^ a b c d 植村 pp. 224-227. 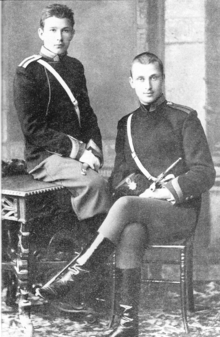 ^ See, for example, Stig Jägerskiöld, Mannerheim 1867–1951). ^ No. 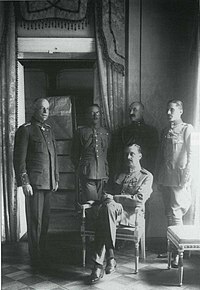 77, Nousevan Auringon Ritarikunnan I luokka Paulovniakukkasin, Japani, mannerheim.fi. ^ 1905年 ロシア帝国によるフィンランド抑圧に抵抗して労働者階級が形成した民兵組織、百瀬・石野 pp. 64-65. ^ 1905年 ロシア帝国によるフィンランド抑圧に抵抗してブルジョア、農民階級が形成した民兵組織。百瀬・石野 pp. 64-65. ^ 君主制への移行のためにスウェーデン統治時代の役職が適用されていた 植村 pp. 108-110.